A growing number of prominent Shiite clerics are questioning whether the supreme leader can claim divine authority. It’s not surprising that the arrest of a prominent Iranian cleric — even one that led to protests in Iran and the Arab world — hasn’t made a ripple in the Western news media. After all, the Tehran regime makes arbitrary arrests all the time. But this is different: The controversy over the detention of Ayatollah Hussein Shirazi this month is reigniting an important debate over whether Iran’s supreme leader, Ayatollah Ali Khamenei, should be able to claim divine sanction for his unlimited powers to rule the state. Although there has been an ongoing debate in Shiite Islam since Ayatollah Ruhollah Khomeini institutionalized the system of clerical rule, or velayat-e faqih, shortly after the 1979 Islamic Revolution, discontent is now growing. Specifically, there is an increasing belief across Shiite communities that the consolidation of all powers in one person is antithetical to the Shiite tradition and that the position of supreme leader should be reformed or dissolved altogether. Things came to a head on March 6 near the holy of city of Qom, when Ayatollah Shirazi was detained, reportedly by the Islamic Revolutionary Guards Corps. The cleric and his very influential father, Grand Ayatollah Sadiq Shirazi, are fierce opponents of Khamenei’s rule. The younger Shirazi reportedly called the supreme leader “the pharaoh” during one of his recent lectures, providing the pretext for his arrest. Protests quickly followed, and not just in Iran. After Shiite clerics in Kuwait and Iraq condemned the arrest, there was unrest in the Iraqi holy Shiite cities of Karbala, Najaf and Basra, as well as in Kuwait City. Demonstrators in London gathered outside the Iranian Embassy; four were arrested after they climbed onto the porch and took down the Iranian flag. None of these protests was large — estimates range from several dozen to several hundred participants — but they are notable nonetheless. The Shirazi family, whose members have been clerics since the 19th century, represent an influential school of Shiite thought. Grand Ayatollah Shirazi has a vast presence online: he gives lectures in Persian and Arabic with English subtitles that are broadcaston 18 television channels and three radio stations across the Muslim world. Some leading figures in the Shirazi school favor the separation of mosque and state, a Shiite tradition with a long-established history. Others are not against velayat-e faqih in principle, but oppose how Khomeini and Khamenei have corrupted the concept by concentrating all control over the state in a supreme leader who is virtually impossible to remove from power. Many other clerics in Qom, the center for Iran’s religious seminaries, are also against supreme clerical rule on theological grounds, even if they are not adherents to the Shirazi school. When I was a reporter for the Guardian newspaper in the 1990s, I interviewed many Iranian clerics who told me they did not believe a living person should have divine and absolute powers. The supreme leader, they said, cannot represent God on earth. The Tehran regime was so intent on keeping this dissent a secret that I was barred from traveling to Qom. But now, four decades after the Islamic Revolution, the genie is out of the bottle. Widespread discontent within Iranian society has empowered the Shirazis and other religious leaders to make their views public. 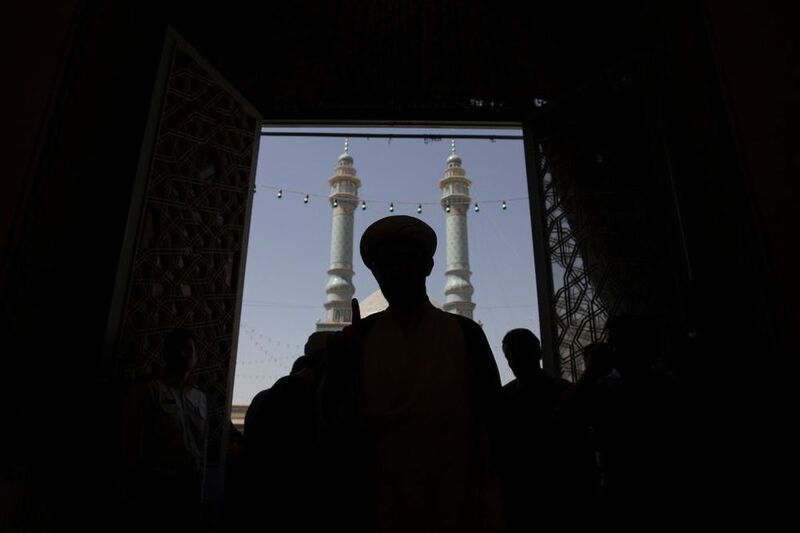 In Iraq, too, the Najaf religious leaders vehemently oppose supreme clerical rule and are finding avenues to reduce Iran’s religious and political influence over their country. In the run-up to May’s Iraqi national elections, Shiite religious parties are forming coalitions with Sunnis and nationalists in the hopes that the next parliament will consist of fewer Iran loyalists, and that the next prime minister will be more liberated from Tehran’s demands. If nothing else, this should debunk the notion that all Shiites are alike. Arab Shiites have historically held different political and religious views from those in Iran, but are often considered in the West to be loyalists of the Islamic Republic. For all these reasons, the Shirazi protests have been significant. Iran’s special clerical court initially sentenced the younger cleric to 120 years in prison. The hardline prosecutor-general, Mohammad Jafar Montazeri, accused his Iranian supporters of being “a Qom-based group that has been active in Iran for years,” in an attempt to minimize the numbers of clerics and others who support the Shirazis views. But this argument became harder to make as the protests spread. And now there are uncomfirmed reports that Iranian authorities released Shirazi on March 18, two weeks after his arrest. If true, the heavy-handed sentence and its subsequent retraction illustrate the Islamic Republic’s struggle to balance a growing sense of vulnerability with the fear of alienating the body of clerics upon whom its legitimacy ultimately rests. The Shirazis are not the first prominent Shiite religious leaders to question the supreme leader’s divine authority. In 1999, I conducted an interview with Ayatollah Hossein Ali Montazeri, who spent many years under house arrest before to his death in 2009. Nonetheless, in his nearly 30 years as supreme leader, Khamenei has done everything described above. Now that his rule is coming to a close, there is increasing support among high-ranking Shiite clerics that the job should die with him. I agree with the Shiite clerics on this one- the position of Supreme Leader should die with its present holder, if not beforehand.